Products related to the role playing game. 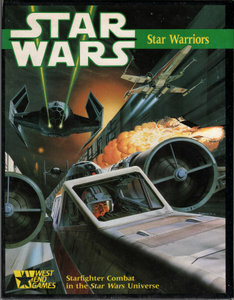 "Star Warriors puts you at the controls of the TIE fighters, X-wing and other starfighters from the Star Wars universe. You'll jink, roll, loop, angle deflectors, dodge lasers, and return fire — pushing your ship and yourself to the limit as you battle to decide the fate of the galaxy! 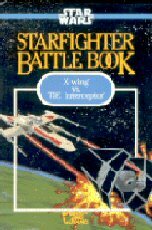 • Data for TIE fighters, TIE interceptors, X-wings, A-wings - and every other major Star Wars starfighter! 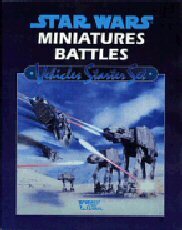 • Detailed but easy to learn rules for snap fire, overturns and other maneuvers — you'll fly starfighters the way Rebel pilots fly them in the movies! • Standard, Advanced, and Optional rules - - you pick the complexity! • Beautiful 22" by 34" full-color space map. 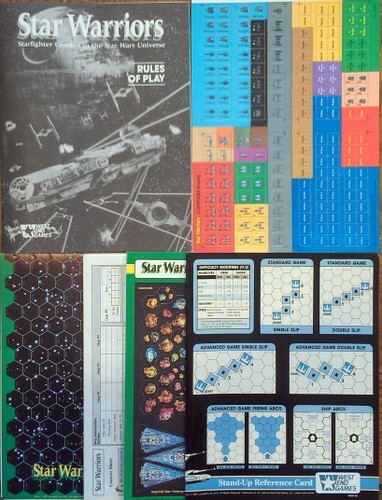 • 80 full-color ship counters and 100 game markers. • Full-color cardstock sheet of asteroids and Star Destroyers. • Pad of Ship's Log record sheets. • Stand-up charts and tables screen. • 32-page booklet with standard, advanced and optional rules, plus scenarios. Can you, as General Veers, commander of the Imperial Ground Assault group, destroy the Rebel energy shield generator and crush the Rebellion before the Rebels can evacuate the planet? Can you, as General Rieekan, commander of the Rebel Ground Defense force, delay the massive Imperial Walkers long enough for your band of freedom fighters to make their escape? * Realistic terrain map of the northern Rebel Defense Perimeter of Echo Base Hoth. * Over 55 stand-up playing pieces including giant Imperial Walkers and lightning-fast Rebel Snowspeeders. * A deck of Action Cards, telling the players when to move and fire. * A deck of Event Cards, detailing unexpected events like the arrival of reinforcements or the intervention of the Force. * Eight Special Fire Dice with pictures of Darth Vader and Luke Skywalker's Lightsaber. * A rules manual to help you get right into the action on ice planet Hoth." Hundreds of Imperial troops surround the Rebel strike team: stormtroopers, speeder bikes, and AT-ST walkers. The mission has failed. With the energy field still protecting the new Death Star, the Rebel fleet faces imminent destruction. The last hope of the Alliance lies with a handful of captured heroes and an unorganized army of natives -- Ewoks -- whose weaponry is no match for Imperial firepower. Can you, as the Rebel leader, reverse the fortunes of war? An innovative solitaire system controls the Imperial forces, Your enemy has great firepower and the ability to shift tactics, All you have is your skill, your courage — and the primitive technology of a clever and resourceful ally, May the Force be with you. • Realistic terrain map of the Imperial Defense Perimeter of the Imperial Garrison on the Forest Moon of Endor. 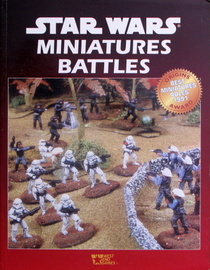 • 62 stand-up playing pieces including Ewok catapults, AT-ST walkers, and Imperial speeder bikes. • A deck of Action Cards, telling the players when to move, fire or try to breach the Imperial complex. 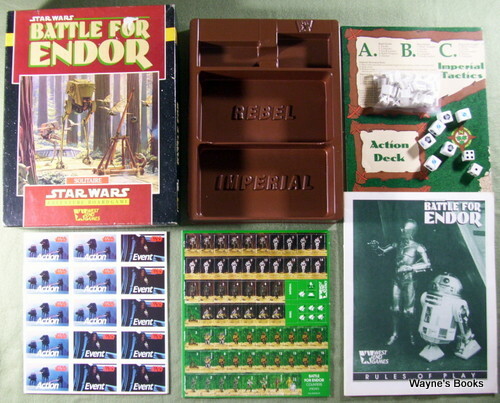 • A deck of Event Cards, detailing unexpected events such as Imperial reinforcements, or Chewbacca's boarding of an AT-ST.
• Six special fire dice with pictures of Darth Vader arid Luke Skywalker's Lightsaber, as well as two six-sided dice. • A rules manual to help you jump right into the action of the Alliance's greatest victory." "Escape from the Death Star recreates the dramatic escape scene in Star Wars IV: A New Hope. In this scene, the Rebel Heroes Luke Skywalker, Han Solo, and Chewbacca, a Wookiee, free Princess Leia Organa from her prison cell in the awesome Imperial battle station known as theDeath Star. 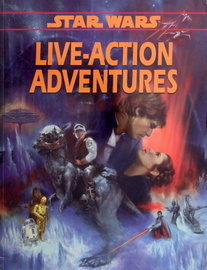 Following Leia's release, a frantic escape and chase occur as the four Heroes makes their way through a maze of corridors toward Solo's ship, the Millennium Falcon. 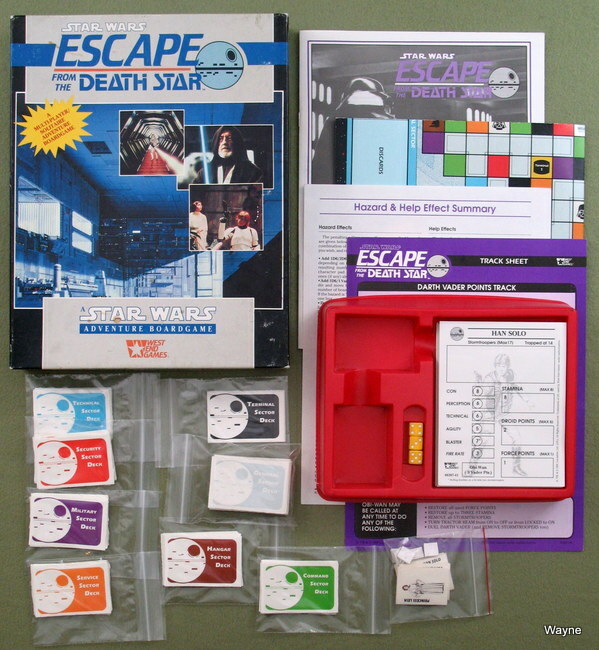 Escape from the Death Star is an exciting simulation of this great Rebel adventure. Can you, as Luke, Leia, Han, or Chewie, duplicate the feat of the movie Heroes, and escape from the Death Star?" "The Star Wars saga continues . .. Lightsabers clash, good battles evil, and Luke Skywalker confronts Darth Vader for the fate of the galaxy! Luke Skywalker, hero of the Rebel Alliance — strong in the Force but not yet a Jedi Knight. Darth Vader, master of the Dark Side — a renegade Jedi corrupted by the evil Empire. They must meet on the field of battle, wielding only lightsabers and the mysterious powers of the Force in mortal combat. The destiny of the galaxy depends on the outcome of this epic confrontation. And the outcome of the confrontation depends on — you! 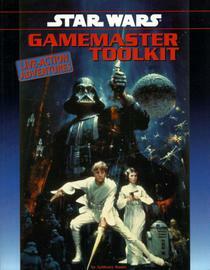 In this thrilling two-player game, one player controls Luke Skywalker and the other controls Darth Vader. Whoever best combines deadly lightsaber strikes with skillful use of the Force will emerge victorious. 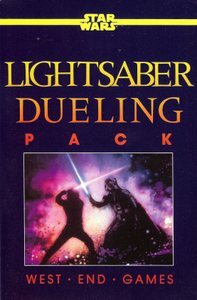 This lightning fast, spectacularly illustrated Lightsaber Dueling Pack contains everything you need to stage heroic lightsaber duels in the world of Star Wars, including one Luke Skywalker Character Booklet, one Darth Vader Character Booklet, and two Maneuver Cards." 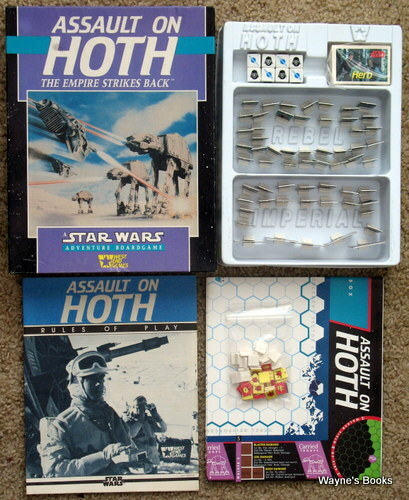 Contains 2 seperate books (X-wing & TIE Interceptor). "Snowspeeders streak across the battlefield in a sweeping counterpoint to the terrifying advance of Imperial AT-AT walkers. Weapons blaze and the metallic hides of these modern beasts of war are scored by the burning impact of blaster bolts seeking to penetrate their armored shells. The muffled thud of internal explosions signals the death of one of these great machines. ~~ Finally! Add vehicle combat to your Star Wars Miniatures Battles game. This long-awaited supplement has full rules for vehicle combat, flight, a rules upgrade and expansion, new equipment and a miniatures battle campaign. Also included are details of unit insignia and organization for Rebel, Imperial and other forces in the galaxy." 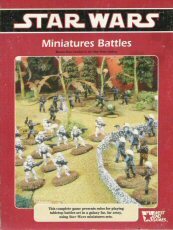 "This supplement to the award-winning Star Wars Miniatures Battles game provides a number of engaging scenarios set in a galaxy far, far away. 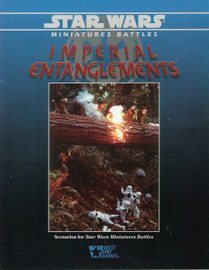 Within these pages you will find exotic environments, familiar aliens and tactical challenges, all with suggestions for staging the scenarios and rules for any special conditions that may apply, as your troops battle their way across a forest canopy, a lava plain, the floor of an impenetrable jungle and other strange locales. These are some Imperial entanglements you won't want to avoid." 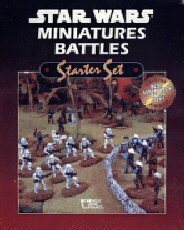 Contains: Star Wars Miniatures Battles book; 12 miniatures; dice (5d6). 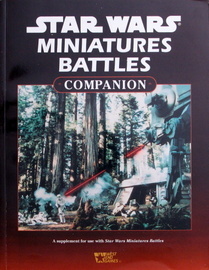 Contains: Vehicles Companion book; 3 vehicles (2 speeder bikes & snowspeeder); dice. "Welcome to the Gamemaster Toolkit! The Toolkit is a resource for the gamemaster of Star Wars Live-Action Adventures, designed to make your life easier when planning and running live-action roleplaying adventures (LARPs). * Part 1 features tips on logistically planning and running LARP events. From building up a pool of players to elegant ways of wrapping up a game out of control, it's all here. And if dice and LARPs don't mix in your group, try out the two new alternate diceless systems we've cooked up. One is a flexible card-based system with some cool randomizing features, while the other is a quick and deadly system that, like "rock, paper, scissors," is a hands-only event. * Visit Ord Mynock Freeport in Part II. A detailed spaceport setting for your live-action adventures, Ord Mynock Freeport includes locations for encounters and has numerous gamemaster characters to provide atmosphere and information for players. * Part III consists of four ready-to-run scenario modules for five to eight players. Use one scenario module for an evening's worth of entertainment, or combine two or more modules for a full-sized live-action adventure for up to twenty-five players. * And finally, tools and toys to enhance any Star Wars LARP event! Part IV features new Item Cards, Support Character Cards, equipment tables, and more." 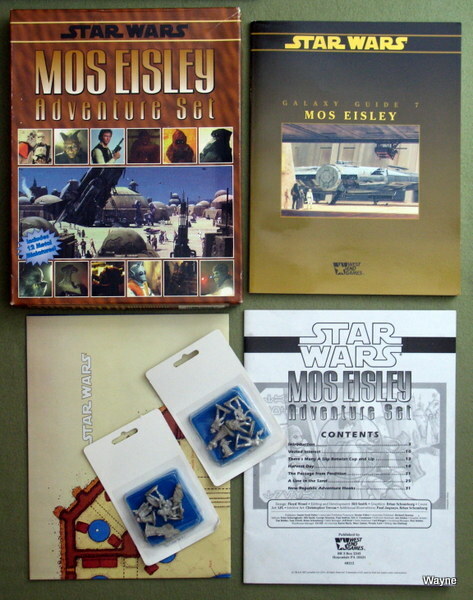 Includes: Galaxy Guide 7: Mos Eisley; Map; Adventure Guide; 12 figures. 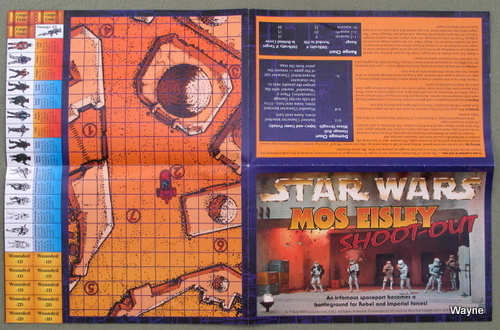 Pamphlet-sized mini-game distributed at San Diego ComicCon.